The field of piano technology is an unregulated trade. Therefore the Piano Technicians Guild has set its own standards of quality for piano technicians. The Guild has two types of members: Registered Piano Technicians and Associates. Associate membership is open to all individuals18 years of age and older with a professional or avocational interest in piano technology. On the other hand, the title of “Registered Piano Technician” must be earned by passing a series of examinations. To attain the RPT classification, a PTG member must pass three examinations. A written exam tests basic knowledge of piano design, tuning theory, repair techniques and various other topics relevant to piano technology. Two separate practical, hands-on exams test tuning and technical skills. The practical exams are administered by panels of RPTs under the leadership of examiners trained and certified in standardized exam procedures. Exam procedures are designed to comply with standards of objectivity mandated by US anti-trust legislation, thus assuring that exams are fair and equivalent regardless of where or by whom they are administered. On the tuning exam the candidate must match as closely as possible a “master tuning” created by a panel of examiners who have agreed – after painstaking experimentation and analysis – on an optimal tuning for the test piano. The exam is scored by using extremely sensitive electronic equipment to measure the deviation of the candidate’s tuning from the standard thus established. Candidates who use electronic tuning devices in their work must nevertheless demonstrate their ability to tune by ear, unaided by electronics. The technical exam requires the candidate to demonstrate professional-level skills in assembling a grand and a vertical piano action (the mechanical component of the piano) and in making all the complicated adjustments (called “regulation”) so that they function properly. The candidate must also demonstrate facility in various common repairs involving wood, cloth, felt, piano wire and other materials commonly used in pianos. All the procedures on these exams must be completed in prescribed time periods – thus demonstrating the fluency required of a professional. Only Registered Piano Technicians can advertise with that title. 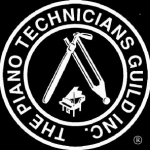 The Piano Technicians Guild does allow Associate members to advertise as “Associate” members, but these members have not yet passed the exams. They are encouraged to take advantage of PTG’s educational offerings. When you are looking for service on your piano, look for a Registered Piano Technician. The logo above designates that the member is an RPT. Note the words Registered Piano Technician in the logo itself.